The Lifebook AH531's design is unremarkable but sufficient. There's a glossy black shine to the lid that looks good, but proves susceptible to marks and scratches. Even though we weren't enamoured with the design, it does feel solidly built, with very little flex around the keyboard or the optical drive. We were pleased to see that a significant improvement has been made with the keyboard on the AH531. It fails to compete with the likes of the Lenovo B570, but there is a surprising amount of travel on the keys that makes typing more comfortable than you'd think from looking at it. There's also a dedicated numeric keypad to the right of the main keyboard, but it's small and slightly cramped. That's nothing compared to the touchpad though, which is almost comically tiny and quite difficult to use. The 15.6-inch widescreen display is bright and sharp. Images are well-reproduced, although some colours (particularly reds and oranges) appear a little washed out. There's a slight blueish tinge that we didn't see on the likes of the Lenovo or the Compaq, but to be fair, the sharpness of the picture is excellent. The screen boasts a pixel resolution of 1,366 x 768 and is perfectly suitable for watching 720p HD videos on YouTube or iPlayer. We were pleasantly surprised to see that Fujitsu has given the Lifebook AH531 an expansive 500GB of onboard storage space. If you're planning on getting rid of your DVD collection in favour of downloadable content, you'll have space for plenty on this laptop. 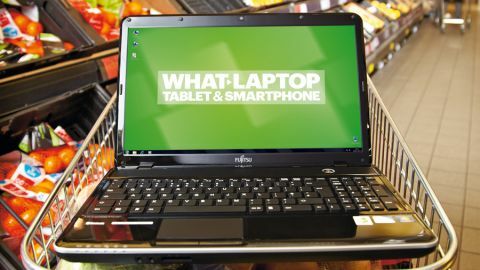 The Fujitsu fared well in our tests, and more or less matched the Lenovo B570 for both graphics and central processing. We had several web pages open, music playing and a couple of Word documents on the go simultaneously, and didn't have any trouble switching between them quickly and smoothly. The Lifebook AH531 boasts 4GB of memory, which is the minimum you should really be looking for. It's not short on connectivity either, boasting 802.11n Wi-Fi (the fastest available), Bluetooth, three USB ports, and HDMI and VGA connections for external monitors. The earlier iteration of the Fujitsu Lifebook AH530 suffered from a below-par battery life, but that doesn't appear to be the case here. We subjected the AH531 to the same tests as all the other laptops we test, and it sailed through with a commendable score of 179 minutes. This was better than the previous Lifebook AH530, and with sensible usage we would expect the Fujitsu to perform well away from the AC adapter. The Fujitsu Lifebook AH531 isn't a bad choice for a budget laptop and we would definitely choose it over the Compaq Presario CQ57 and the HP 620. It's definitely more of a contender than the previous Lifebook and the new keyboard makes it a good bet for frequent typists. Aside from the slight fade in the screen colour, this isn't a bad choice if you're on a budget and looking to pick up a new laptop.